Six months ago I started my website/blog and one of my posts included strange education vocabulary. Some of the words used to mean something relevant and different from their meaning today. But most of these words have been used by education reformers to change the nature of public schooling. Many of the words or phrases today are rather amusing if not bizarre. 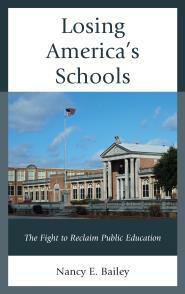 Often they are subtly or boldly critical of teachers and public schools. Consider “student-centered.” If you are a teacher when are you not student-centered? It reminds me of “teaching and learning” which, where I live, has been heavily used. Don’t you just presume a student will learn if a teacher teaches? Some of these are tech related and I got them from Meris Stansbury of eSchool News http://www.eschoolnews.com/2013/11/08/education-buzz-words-218/2/. The interpretations are my own. Arts integration—A euphemism for we have stolen your art programs but really we have art and music included in reading somewhere where we can test it. We have enough drama. BYOD (Bring your own device) and BYOT (Bring your own technology)—These sound too party-like for me. Common Core aligned—No comment needed. Digital Natives—The natives are restless! Flipping—Adults and teens might think differently about this term—neither of which is correct. Future-proofing—I have absolutely no idea. Innovation skills—As opposed to the old dull skills of times gone by…. KUDS (Know Understand and be able to Do)—as opposed to DUDs or DUH. MOOC (Massive Open Online Courses)—Good luck! Sage on the stage and Guide on the side—Bore students by blathering on in a lecture. Or bore students by guiding them on the side. Sputnik moment—Quick call NASA or whoever. Tech-savvy—As opposed to not tech-savvy. Thinking out-of-the-box—I am guilty of saying this much too much. Tipping point—A bit worrisome if you tend to think negatively. Tripod—I added this one in honor of Tennessee parents. What does it mean? Anyone? Hint. It has nothing to do with photography. Project-based—Instead of micro-managed school work you work on a project 5 minutes in-between test prep. Or you take it home and make your parents do it for you. Right-brain thinking—As opposed to left-brain thinking or no brain thinking or in the middle of the brain thinking. If you have some strange education words to add, or your own interpretations, let me know. Here are the words. Enjoy the day. I just discovered your website. It’s terrific. As to the edu-jargon, here’s my attempt to define a few. Thank you, Jorge. I will have to re-post this soon and give you credit for this. I will add, Charlotte. Thank you! Robert, I don’t know whether to laugh or cry! I am going to re-post this eventually and I will give you credit for this. Nancy, thanks. 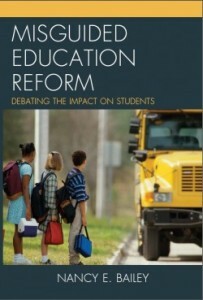 The funny comments make it even clearer, how nonsensical this ed reform culture is. Do people have the impression that this officious, overly verbose language is coming from business? It certainly looks like that’s where it is coming from, but I don’t know how many understand that. Education has always had wordiness, but it’s worse. Thanks, Máté! I can’t wait to see what the teachers and the parents who read and write at the Ravitch Blog have to say about this. Every now and then, however, some ‘jargon’ becomes part of what I say. When I was the NYC Cohort, for the Pew research on the National Standards ( using Harvard’s PRINCIPLES OF LEARNING) I attended seminars for 2 years, given by the staff developers of the LRDC) who teach the nation’s school sytems staff developers. Talk about jargon. Good jargon repeated often, helps one to grasp a concept. Here are those I incorporate into my writing when I SPEAK AS A TEACHER because WORDS MATTER! WLLL (my acronym) for What Learning Looks Like. They began every seminar with that focus do we teachers actually recognize what learning looks like? Teachers who do this can explain to parents what real learning actually resembles, and CAN TEACH IN WAYS THAT KIDS LEARN… and you can bet IT DOES NOT LOOK LIKE a child sitting ‘centered’ in front of a computer. It does not look like a pretty room with lots of bulletin boards, but no real library of interesting, informative, books that children can read. It does not look like a classroom where children sit as a teacher bullies them into listening and paying attention, as we see in some of the reformed charter schools. WITT is another of my acronyms, from those years when i was privileged to be the cohort and to learn better PROFESSIONAL ‘practice’, even after 4 decades of teaching. 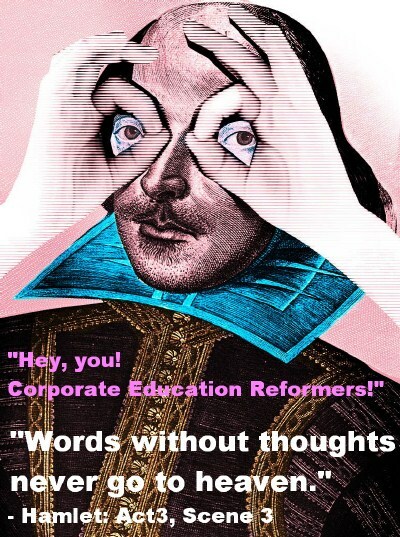 * Anti-Learning MANDATES from non-educators and business people who run the show from above. * Media that repeats lies about those bad teachers, and never reveal to the public WLLL… what learning Really looks like she a ‘real ‘teacher is in that classroom. WORDS MATTER (as we have seen in this election cycle where a serial liar dissembles in public! Duncan and clones of the top dogs in the EDUCATIONAL INDUSTRIAL COMPLEX, sold the narrative about ‘teaching’ (not learning) and the ‘reformers’ deformed a working public education system that raised millions of Americans into the middle class and beyond. Thank you this fit for me perfectly! Malanthropists (those who use taxpayer-subsidized non-profits to advance their financial and political interests). Naifs: those who uncritically accept the premises of so-called reform, See Recruits, TFA and Colonizers, above. Opportunists: those who uncritically go whichever way the wind blows, and are an essential cog in the so-called reform machine. See AdminBots. Grit- because our traumatized, lunch program eligible, homeless kids living in foster care or with relatives don’t have enough GRIT?! Grit is the key to student success. IF students eat enough grits each day at breakfast time starting in kindergarten, especially cheese grits with shrimp, then they will improve their SBAC/PARCC standardized test scores at least 100 points each year and be college and career ready by their senior year. Eric Hanushek’s research using VAM proves that this will happen. Indeed, the “voice and choice” of none other than Bill Gates. Anyone have any thoughts on/experience with the “mastery-based” vocabulary? Do you know the meaning of the word ‘hyperlearning’ ‘hyperlearners’? If you find the meaning, please add it to the list. Your blog is super awesome! That’s a good one. I will look it up! Thank you, Christal! Wiki gives this definition: “A form of self-directed, non-linear learning using modern information technology.” Meaning the child teaches themselves. Hyperlexia is interesting. A student reads earlier than expected but has other verbal and social disabilities with comprehension.